It is replaced by the Datamax-O'Neil I-4212e. Thermal transfer, 203 dpi, 8 ips, 4" print width, parallel & serial interfaces, 8MB DRAM, 1MB flash. Includes rewinder, peel & present & US power cord. Order cables separately. See accessories. Thermal transfer, 203 dpi, 8 ips, 4" print width, parallel, serial, & Ethernet interfaces, 8MB DRAM, 1MB flash. Includes US power cord. Order cables separately. See accessories. Thermal transfer, 203 dpi, 8 ips, 4" print width, parallel & serial interfaces, 8MB DRAM, 1MB flash. Includes US power cord. Order cables separately. See accessories. Direct thermal only, 203 dpi, 8 ips, 4" print width, parallel & serial interfaces, 8MB DRAM, 1MB flash. Includes rewinder, peel-presenter & US power cord. Order cables separately. See accessories. Direct thermal only, 203 dpi, 8 ips, 4.1" print width, parallel, serial & Ethernet interfaces, 8MB DRAM, 1MB flash. Includes US power cord. Order cables separately. See accessories. Direct thermal only, 203 dpi, 8 ips, 4.1" print width, parallel & serial interfaces, 8MB DRAM, 1MB flash. Includes US power cord. Order cables separately. See accessories. Thermal transfer printing, 203 dpi, 4" print width, USB Interface, and Coated Side Out. Includes US power cord. Order cables separately. Thermal transfer printing, 203 dpi, 4" print width, Parallel and Serial Interfaces, Coated Side Out, and Rewinder. Includes US power cord. Order cables separately. In applications that are printing constantly throughout the day, replacing labels and ribbon on a printer can drastically slow down any business. The I-4208 is one of the easiest industrial printers to use and replace media on and will keep printing downtime to a minimum. 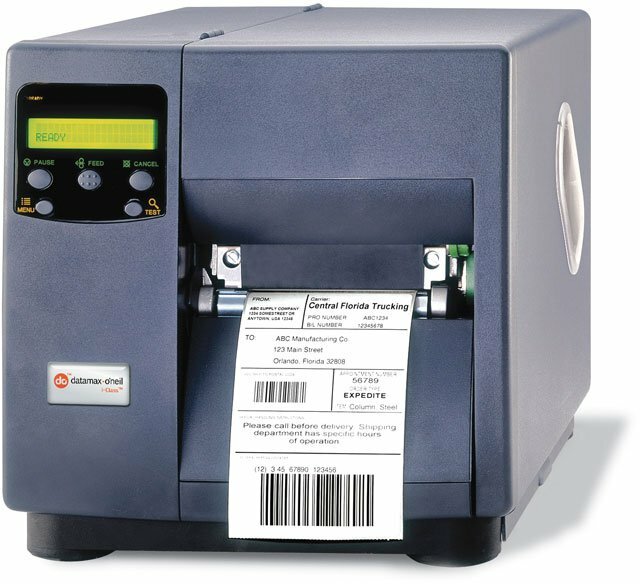 With its rugged design, the I-4208 is ideal for inventory, shipping, and even compliance labeling in any warehouse. You can also easily integrate the I-4208 with an assembly line or other warehouse systems with all of its additional interface options that are available. The Datamax O-Neil I-4208 is made for businesses that print labels or tags everyday and need a reliable, easy to operate printer that can handle the stresses of constant use.